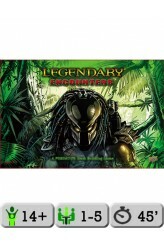 Legendary Encounters: A Predator Deck Building Game is based on the first two movies of the Predator series. Taking on the roles of characters from the films, players take turns recruiting cards for their deck from a central selection in order to improve their deck and defeat Predator cards that are added to the central game board. In more detail, within the setting for each film you can play as the humans or as the Predators. As the humans, you play the co-op version of the game as in Legendary Encounters: Alien, recruiting, scanning and attacking the same way while trying to achieve objectives. When you play as the Predators, the game is player vs. player instead of co-op, with each player assuming the role of a Predator hunting for the most honor (VPs). Legendary Encounters: .. 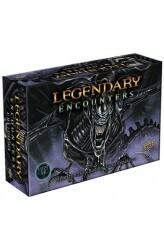 Legendary Encounters: An Alien Deck Building Game, based on the four movies of the Alien series, is a fully cooperative game with original art. While based on the Marvel superheroes version of Legendary, the two games will be compatible but cannot be fully integrated. 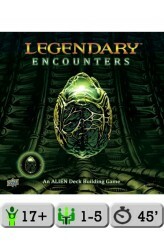 Legendary Encounters is a deck-building game in the same family as Legendary: A Marvel Deck Building Game, but now players must cooperate in order to survive against hordes of aliens. Taking on the role of protagonists such as Ripley, Dallas, Bishop and Corporal Hicks, players take turns recruiting cards for their deck from a central selection in order to improve their deck and defeat Xenomorph cards that are added to the central game board. 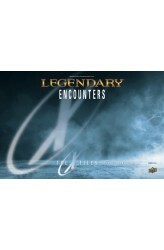 Product Breakdown: > 500+ total Original Art Card Set > Full Col..
New expansion to the 2014 acclaimed game, Legendary Encounters: An ALIEN Deck Building Game. More facehuggers, more ALIENS and, finally, more ALIEN QUEEN! The roster of characters grows with this expansion to include Lieutenant Gorman, Superintendent Andrews, Captain Elgyn, and Kane! There will be a new unique playmat to allow players to play as the ALIEN Queen! 400 new cards featuring all original art. .. In the cooperative game Legendary Encounters: The X-Files Deck Building Game, you play a team of agents — choosing from among Mulder, Scully, Skinner, Doggett, and Reyes — as you investigate the X-Files and work to unravel the greater conspiracy behind them. During the game, your team will play cards from their own decks — recruiting other agents, uncovering evidence, and fighting enemies. If you do well enough, you will face the final challenge – the conspiracy’s vicious “End Game”! How to Play and, Maybe, Win During each game, you’ll play through three “seasons” of the X-Files™ show (the game covers the first nine seasons). Each player starts the game with a deck of basic cards. At the start of your turn, you’ll add a card from the Conspiracy Deck into the Shadows. 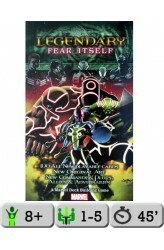 It c..
With the Legendary Villains: Fear Itself expansion for Legendary and Legendary: Villains, you can play through the "Fear Itself" storyline from Marvel Comics. This expansion consists of six new allies from The Worthy: Kuurth, Mul, Skirn, Nerkkod, Greithoth and Skadi; one new adversary group; one new commander; and three new plots. Players can work both with and against other players to defeat Iron Man in his Uru Enchanted Armor as he leads the forces of The Mighty while laying waste to planet Earth! https://www.youtube.com/watch?v=-gi8srtTbXI .. 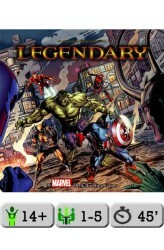 Legendary: A Marvel Deck Building Game is set in the Marvel Comics universe. 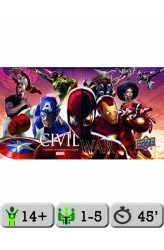 To set up the game, players choose a number of hero decks – Spider-Man, Hulk, Cyclops, Wolverine, etc. – and shuffle them together; since players use only a handful of hero decks out of the fifteen included, the hero deck can vary widely in terms of what's available. Players then choose a mastermind villain (Magneto, Loki, Dr. Doom, etc. ), stack that particular villain's attack cards underneath it, then modify the villain deck as needed based on that villain's particular scheme. Over the course of the game, players will recruit powerful hero cards to add to their deck in order to build a stronger and more resourceful deck. Players need to build both their recruitment powers (to enlist more heroes) and their.. Welcome to a world of microscopic science and adventure...welcome to the Microverse! Ant-Man and Wasp are world-renowned adventurers — two of the original founding Avengers. Together, they have fought for justice in the Avengers' greatest victories...and their most terrifying defeats. Hank Pym, the original Ant-Man, has always had a giant ego to match his genius intellect. In a fit of hubris, he created the powerful robotic intelligence Ultron, which eventually built massive legions of robotic soldiers, threatening the world repeatedly and upgrading into a stronger form each time. 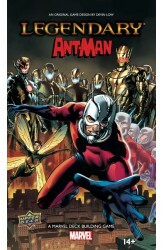 Legendary: Ant-Man is a 100-card expansion for the Legendary: A Marvel Deck Building Game that contains five new heroes, two new masterminds, two new villain groups, and four new scheme.. 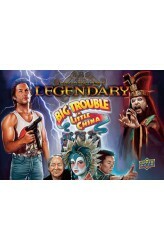 Description from the publisher: Become Legendary with the mystical arts seen in the cult hit film Big Trouble in Little China! In the deck-building game Legendary: Big Trouble in Little China, players work their way through the co-op game trying to defeat Lo Pan and the three storms! Play as Jack Burton, Gracie Law, Wang Chi, and even the Pork Chop Express as you play schemes straight from the film. https://youtu.be/xtdveT-z2Iw .. 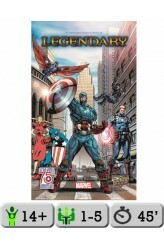 Legendary: Captain America 75th Anniversary is a small box, 100-card expansion for Legendary: Marvel Deck Building Game that focuses on the esteemed legacy of Cap and his fellow comrades that have taken up the mantle of the greatest soldier of all time! https://www.youtube.com/watch?v=X9tgNowR2Ns .. The Champions are here and determined to bring optimism to the world after Civil War II when Avenger fought Avenger. 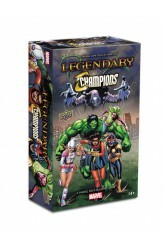 This 100 card small box expansion contains new Heroes, Schemes, Villains, and Masterminds in a new and never before way in Legendary: Champions. https://www.youtube.com/watch?v=Sjhov_ret6I .. In Legendary, players take on the roles of Marvel heroes, including the Avengers and X-Men, and team up to defeat an evil Mastermind. Legendary: Civil War is the fourth big box expansion since the Dark City release in 2013 and lets you play through the Civil War storyline from Marvel Comics! With the Civil War expansion, you can now team up with a partner and take sides against the opposition while playing through the Civil War. The game features playable characters from both sides of the Super Hero Registration act. Will you choose to side with Captain America or Iron Man? .. There is a darkness rising in the Marvel Universe! 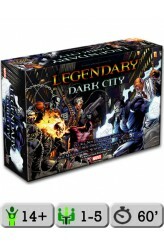 Legendary: Dark City, the first expansion to "Legendary: A Marvel Deck Building Game," brings an entirely new level of play to the critically-acclaimed card game. In Dark City, players use new heroes like Cable, Daredevil, Professor X, and Blade to face off against deadly, all-new Masterminds like Apocalypse, Mr. Sinister, and Kingpin! Legendary: Dark City features 350 all-new cards, including cards for seventeen new Heroes (including X-Force, X-Men, and the Marvel Knights), six new Villain Groups, two new Henchmen Groups, eight new Schemes, and five amped-up new Masterminds more powerful than ever before. Each Hero features four different all-new artworks. A new "Unique Bystander" mechanic gives special rewards to players who rescu..